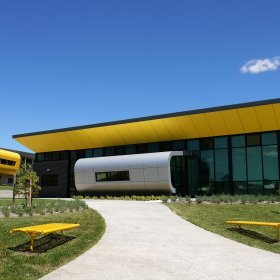 A rapidly growing area in Melbourne, Doreen in the Shire of Whittlesea, has recently constructed a number of government and independent educational facilities to support the growth in this region. 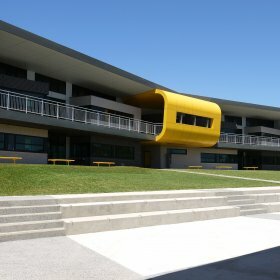 The Hazel Glen Secondary College and Primary School in Doreen South is one such Government facility, recently established as a leading educational provider. Lambert & Rehbein, as part of the project consultant team lead by Minx Architecture, were involved in the Structural/Civil Engineering design and delivery. The facility is situated on 10 Hectares and comprises of the recently completed primary school and stage 1 of the Secondary College, with stage 2 to be completed in 2016. Minx Architecture, through high quality design, delivered a vision to support growth activity in the area by the specification of innovative building materials and structural systems incorporating construction methods allowing for flexible use of internal and external spaces. This included student gathering areas, terraces and sporting grounds as well as efficient use of vehicle and pedestrian access between all facilities throughout the site. Car parking for 75 car spaces and access roads which link parking areas between the primary school and secondary college. In addition to the above components the design team successfully achieved a number of challenges relating to the steep grade of a major section of the site, along with drainage outfall and interface treatment of adjoining roads, not yet constructed. Coupled with the early stage package involving bulk filling one part of the site with 84,000 cubic metres of compacted engineered fill, for access and Drainage improvement, Lambert & Rehbein found this project rewarding and a successful outcome for the client.